Removing environmental elements from your windshield is vital to safe driving. Replacing your windshield wipers with Genuine Toyota Wiper Blades on a regular basis will help. Toyota Genuine Wiper Blades are designed to the exact specifications of your vehicle. Your Toyota’s windshield wiper blades should be properly sized with correct windshield curvature and have the moisture removal capabilities that keeps your vision clear when driving in inclement weather conditions. 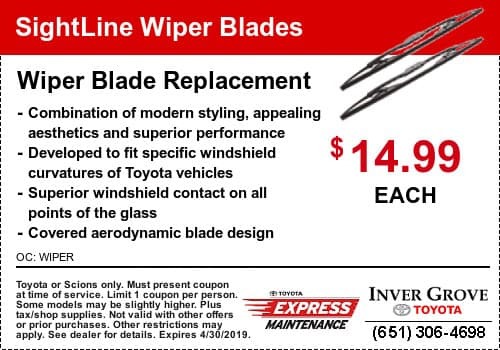 Order Genuine Toyota Wiper Blades from Inver Grove Toyota to keep your Toyota a Toyota. Need your Toyota Genuine Wiper Blades installed? Our Toyota-trained technicians right here in Inver Grove Heights at Inver Grove Toyota can quickly handle all of your Toyota windshield wiper replacement needs.